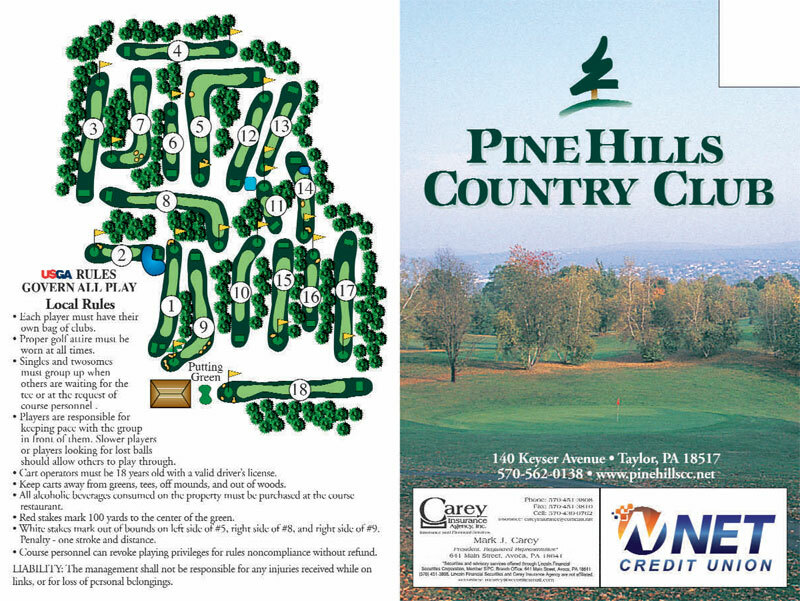 Pine Hills is a 6,000 yard, par 71 course nestled in the Lackawanna Valley. Central to Northeast Pennsylvania and close to Scranton and Montage Mountain, Pine Hills offers scenic views of the valley and a well manicured, and uniquely laid out track. Pine Hills has made a great deal of changes over the years since ownership changed hands in 1998. Most golfers are amazed at how the course has developed over the years. In 2012, 2013, 2016 and 2017 Pine Hills was awarded the Readers Choice “Best Public Golf Course”. And Pine Hills was nominated as a runner up for a “small business of the year” award by the Scranton Chamber of Commerce for two years. The course offers a full service bar and restaurant, with a grill on the 10th tee during weekends. A beverage cart is available on weekends, and our outdoor patio is a great place to enjoy a cocktail or lunch by our practice green. Next to the proshop is a practice area which includes a driving net and chipping area.